The electric sub-meter is used to measure the electrical energy and give the detail of the consumption of the energy. The electrical sub-meter records and measures the electricity consumption for the single unit. It enables the owners of the building to get the detail of the electricity consumption. It can be used in the residential, commercial and industrial buildings. It reduces the extra operational cost as it can be used in the multiple tenants and buildings. There are various advantages associated with electric sub-meter includes ability to measure exact consumption of the energy and elimination of the waste energy. The global electric sub-meter market is anticipated to expand at a CAGR around 12% during 2018-2027. It is expected to reach around USD 4 billion. The increasing demand regarding energy preservation coupled with rising need for monitoring of the electric energy is anticipated to be the major reason fostering the growth of the global electric sub-meter market during the forecast period. The increasing expansion of the commercial and industrial sector across the globe is anticipated to increase the application of the electric sub-meters. This is anticipated to drive the global electric sub-meter market during the forecast period. The increasing demand for monitoring the electrical usage across various industrial sectors is anticipated to fuel the growth of the global electric sub-meter market during the forecast period. The continuous development on the technology which focuses on effective management of the energy consumption by different industrial sector is anticipated to fuel the growth of the global electric sub-meter market. Moreover, the increasing technological development such as cloud computing and IoT is driving the demand for the electric sub meter. The stringent government regulation regarding the electric sub meter installation is predicted to be the major growth driver for the global electric sub-meter market. 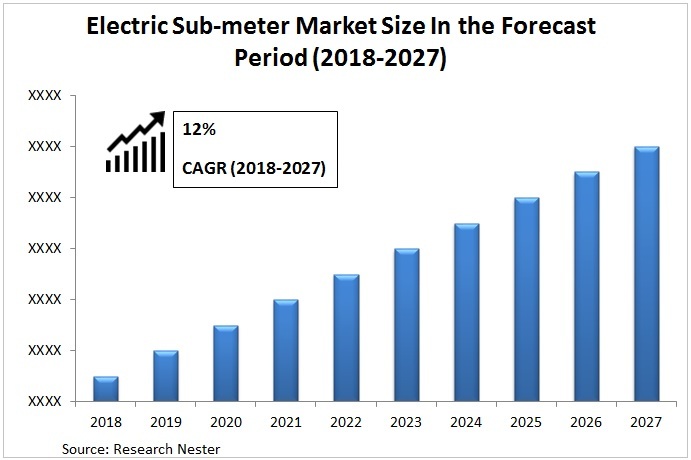 Lack of public awareness about effective management of the energy is anticipated to hinder the growth of the global electric sub-meter market during the forecast period. On the basis of regional analysis, global electric sub-meter market is segmented into five major regions including North America, Europe, Asia Pacific, Latin America and Middle East & Africa region. North America is anticipated to hold the largest market share for global electric sub-meter market during the forecast period. The increasing demand for energy management across the region is anticipated to be the major reason driving the growth of electric sub-meter market in the region. Asia-Pacific region is anticipated to be the fastest developing region for the global electric sub-meter market. The increasing industrialization in the region leads to the expansion of the commercial, household and industrial sector. This increases the application of the electric sub-meter in the region.